Here is a home made key to Lasius based on information found in the links above. Bare in mind this is my interpretation of the info and I've never seen half of these in person. I decided to focus on this genus because it seemed like everyone was finding either L. neoniger, alienus, flavus, claviger, or umbratus. As the first post of this topic shows though there are lots of species out there. Identifying Lasius is surprisingly difficult. Species are broken up into four groups. Niger tend to be dark black brown workers and sometimes amber-orange in color. Flavus, Umbratus, and Claviger all have orange workers, and are almost completely subterranean. Within each group there seems to be a lot of hybridization but this doesn't seen to spread beyond the group they're in. To determine which group the species is found two traits are vital. The first is the size of the eye compared to the size of the head! The second is the length of the maxillary palp which is located under the head and looks like an antenna. Both need to be viewed with a side view of the head. Best by comparing workers I think. Niger group all have large eyes compared to the head. They also have the longest maxillary palp. Claviger group have small eyes compared to the head. They also have the shortest maxillary palp. It's said to be 3 segments long which is another way of saying it can not be seen with the naked eye! Flavus group have small eyes compared to the head (on par with Claviger). They have a short maxillary palp but unlike Claviger it's viable though tiny. Umbratus group have large eyes similar to Niger group. The maxillary palp is said to be somewhere between Niger and Flavus in length. Hopefully you're still with me. As said before species hybridization tends to be common. What's more some species have subspecies or varieties where Lasius you thought you knew has something crazy going on like no hair what so ever. You may be wondering if species can simply breed with one anther interchangeably what in the world keeps them pure? I don't have the answers for all of them species listed but can offer an example. Lasius neoniger is a common species that nests in fields, prairie, and open grassland areas. Step into the woods though and you start finding Lasius alienus which prefers to nest in logs, tree stumps, or mixed nests under dead wood. Hybrids occur in both forest and field but for the most part they hold their nuptial flights above areas where they would normally nest, thus swarms are mostly separate. Before moving on knowing what a Seta Count is is important. Seta Count - The number of Standing Hairs beyond the outline of the following: Anterior Scape Surface as viewed in line with the plane of funicular flexion, and the Outer Surface of the Fore Tibia as viewed in line with the plane of tibial flexion. Standing Hairs - A hair with subdecumbent, suberect, or erect, i.e. forming an angle with cuticular surface of 45degrees or more. This is the most common niger species found in the US. Found in fields nesting in open soil or under stones. Can hybridize with Lasius alienus. 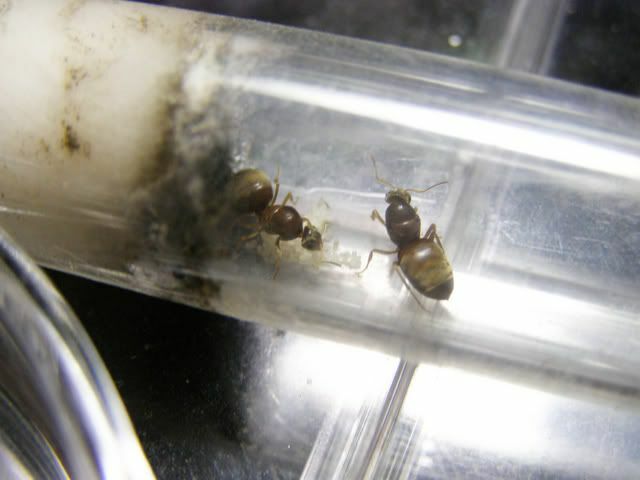 Workers tend to be brown in color with dark legs that are evenly colored. Scape and Tibiae are furry. Queens tend to have a velvet like sheen to the abdomen when viewed at certain angles, but this is consistent with other Lasius. The most common niger species found in wooded areas. Found in woodland, nesting in soil, rotten logs, and stumps. Can hybridize with Lasius neoniger. Workers tend to be black with lighter legs, usually yellow in color. Seta Count is less than 40, usually less than 20 standing hairs. Queens seta count is never more than 10 and is usually 0. Found in fields mostly but sometimes woodland. Nest under stones. Similar to L. pallitarsis but lacks the offset basal teeth which points toward the mouth, rather than toward the other mandible. Similar to Lasius neoniger but typically darker in color and not as hairy on the scape and tibiae. Lasius pallitarsis (2) SW, NW, NC, Alaska, Most of Canada. Found in forests and fields, usually at high elevations between 7000-8000 feet, give or take. Juniper shrubs and dry open places also describes their environment. Nest under stones. These are a subterranean forager (which is odd for the niger group but that's where they are) Eye's can be smaller and L. flavus like (also very odd for the niger group), but the maxillary palp doesn't lie. Scape and Tibiae and for that matter The Entire Body mostly lacking hair. Found nesting in sandy soil with small mounds. Similar to L. neoniger but they have more erect hair on the Tibiae. A bicolored species native to the Mediterranean and middle European countries. The head and gaster are darker shades of brown while the mesosoma tends to be lighter more red toned or blood orange. They are similar to L. neoniger but L. neoniger isn't as darkly colored nor as strongly bicolored. Queens are niger group-like but are a tiny bit smaller and lighter in color. This species isn't as common as L. flavus or L. nearcticus. Found in forest clearings where they nest under stones. Scape and Tibia have hair. Found in forests and fields (though I want to say finding them nesting in fields is more typical of Europe where they make mounds too.) nest in soil under stones or fallen logs. Open sparsely covered ground is ideal. Scape and Tibia are reasonably free of erect hair. See paragraph below. Found in dense woodlands. Nest in moist soil under stones or fallen logs. Thick leaf litter is a must. This is a subspecies of Lasius flavus. Scape and Tibia are reasonably free of erect hair. Lasius flavus and L. nearcticus are hard to tell apart in the western US. They hybridize with greater frequency out there. This doesn't happen as much in the eastern US. Head to head L. nearcticus tends to have a smaller eye compared to L. flavus who have similar sized heads. Lasius flavus's head also tends to narrow some at the mandibles while L. nearcticus doesn't do this as much. Supposidly L. flavus workers are polymorphic and L. nearcticus are monomorphic but I find this do not be true. Perhaps it's more accurate to say L. flavus is MORE polymorphic than L. nearcticus tends to be. This theme of Lasius nearcticus having longer traits (sometimes only by fractions of a millimeter) is consistent, but still makes the two species hard to tell apart. Queens have a smaller abdomen than Niger and Flavus group. These are social parasites of the Niger group. Some are more select than others. This is the most common and wide spread species in this group. Found in both forests and fields, nests under stones in rotting logs and in rotting stumps. Scape and Tibia are not very hairy. This ant is kind of the default model for four subspecies: minutus, speculiventris, subumbratus, and vestitus. They use Lasius alienus, neoniger, and niger as host species. Subspecies of Lasius umbratus. Found in sphagnum bogs, dry forests, or swampy fields. Nests in soil often with mounds or masonry domes. Lots of erect hairs all over the body except for the Tibiae which is mostly free of hair. Subspecies of Lasius umbratus. Found in forests and field. Nest under stones and in rotten wood. Abdomen is mostly free of hair. Scape and Legs have lots of erect hairs! Subspecies of Lasius umbratus. Found in forests and fields. Nests under stones and rotting logs. Replaces Lasius umbratus where found? Supposedly Scape and Legs have dense pubescence (thin layer of fuzz) and occasionally standing hairs. Ant Web specimens don't seem to have this though, at least not on the legs. The hairs must be very short if they do. Subspecies of Lasius umbratus. Found in forests. Nests in rotting logs and stumps. Replaces L. umbratus where found. Scape and Tibia have lots of hairs. Abdomen is especially covered with lots of erect hairs! Lasius nevadensis SW (Nevada) Only found in Nevada. Found in open forests. Nests either under stones or in exposed soil. Scape and Tibiae have longer hair than L. umbratus. Not as shiny as L. vestitus. Has more hair than L. vestitus but less than L. subumbratus. Lasius atopus SW (California) Only found in California. Only found in California, nest in soil under stones. The Scape is very long for a Lasius extending well above the head. This is unique enough that that's all you need to know to ID this species. Found in open woodland and moist fields. Nest under stones. Is found in what has been described as a mountain meadow. Workers are small and pale colored. Queens are very similar to Umbratus group species but most produce a citronella odor. Because Claviger used to be it's own genus (Acanthomyops) the language of identifying them is a little different. The Dorsum side of the Propodeum (top of the last thorax segment), and the Gula (underside of the head, behind the palp) are the main ones. A side view of the ant is best. Some Claviger species have Barbulated or Plumose hair. Barbulated hair means the hair has lots of barbs poking all along the hair. See the top of this ant's head. Plumose hair is similar to barbulated hair but the majority of the barbs at at the tips or top third of the hair, and the effect is greater. see here. By far the most common two species found are Lasius claviger and Lasius interjectus. Subspecies of Lasius claviger. Found in forests and fields. Nest in soil, in or under rotting logs and stumps. Mostly short or very little body hair. Gula is usually free of hair. Found in forests and fields. Nest in soil, under stones, rotting logs, and in stumps. Next to walls of buildings is also noted. Propodeum is very convexed. Differs from L. claviger in that hairs on abdomen fall in rows fallowing the tergites (plates that make up the abdomen). Gula has hair. Subspecies of Lasius interjectus. Found at high altitudes between 5000-8500 feet above sealevel. Nest understones. Easily recognized by almost completely lacking pubescence (thin layer of fuzz) and having a very shiny body. Hairs are very sparse on legs. Propodeum is very convex. Subspecies of Lasius interjectus. Found under stones in mountains at mid levels. I couldn't find exact heights. Body hair is somewhat barbulated and is said to be related to L. colei. This is odd because L. colei isn't considered a subspecies of L. interjectus and yet both have the barbulated hair. Gula and Clypeus has 10 or so standing hairs each. Dorsum of gaster with fair amount of standing hairs. Subspecies of Lasius interjectus. Despite being a subspecies of L. interjectus, I read it's easier to confuse this with Lasius claviger. Workers have more body hair but it's shorter in length. L. claviger and L. coloradensis have divided distribution and are rarely found in the same locations. Subspecies of Lasius interjectus. Found in woodlands at high elevations 7900-9000 feet above sea level. Nest under stones. Pubescence on abdomen is dilute to moderate. Hairs are long! Body is shiny. Propodeum is usually convex. Lasius bureni NC (Wisconsin) Only Found in Wisconsin. Lasius colei SW Only found in the New Mexico and Arizona area. Very uncommon. Related to Lasius californicus. Body hair is barbulated. Gula and Clypeus have only 4 to 8 standing hairs each. Less hair on the abdomen than L. californicus. Lasius creightoni SW (Utah) Only found in Utah. Pubescence somewhat dense and whitish silver in appearance. Found in open forests, and fields. Nest in soil, under stones, or at the base of stumps. Hair all over the body is long, numerous and evenly distributed. Queens are easily identified by their unusually thick legs and modest amount of hair all over their body. Hybridization between L. latipes and L. murphyi is one of the rare cases where a hybrid has been given a species name, L. pogonogynus. (Trager, "Advances in Myrmecology:" 405-417) Hybrids between claviger and with colordensis also occur but not enough to be given formal names. Hybrid species between L. murphyi and L. latipes. Workers are exactly like L. latipes. Latipes has longer hair but that's not saying much. Queens have thick legs of L. latipes but lack the hair on the abdomen. Body hair is otherwise distributed similar to L. murphyi but much longer. Rarely found. Nest in dry soil under stones. Hairs on face has whisker-like effect occurring under the eyes and along the side of the head. Other Lasius have hair here too but the white color seems unique enough to this species. Nest under stones and in rotting logs. Lots of standing plumose tipped body hair. Found in open forests. Nest in soil. Hair on Gula. Pubescence all over body. Wing M. W. (1968) Taxonomic Revision of the Nearctic Genus Acanthomyops (Hymenoptera:Formicidae). Memoirs of the Cornell University Agricultural Experiment Station, 405, 1-173.